A Barney Pillow Pet, how more perfect could a plush toy be for my son. He has a few Pillow Pets already that he adores and he LOVES Barney. He dances and sings anytime he see him. We watch Barney DVDs together and my son learns a lot for Barney. His Pillow Pets he adores he has to sleep with them all. I have been working on asking him to pick just one to sleep with. I am sure now that he has Barney Pillow Pet it will be the one he chooses. As soon as I gave it to him he squealed and cheered. He told me "Barney Mama" it was so sweet! He has been snuggling him all day and giving him kisses. I know it will be hard when it comes time to wash his Barney Pillow Pet. I love that about Pillow Pets that they can be washed and dried. Anytime my son spills something or his Pillow Pet gets ratty I can wash it back to almost new. He loves to hug them when they are warm right out of the dryer. 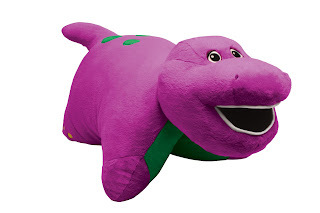 This Barney Pillow Pet would be perfect for any kid who loves Barney. Pillow Pets are a super great item. Its useful and fun. We are fans of Barney on Facebook to see all the updates on the latest Barney news. You can buy a Barney Pillow Pet online at HIT Entertainment Barney Official Shop. You can also find Barney Ornaments and Stocking at the official store.